My grandmother had three rules for Thanksgiving this year: 1) NO SALAD, 2) butter makes it better, and 3) everything should be mushy except for the turkey. We held true to all the rules, but now that Thanksgiving is over it’s time for some crunch and some texture! One of the first meals I made post-Thanksgiving were these burgers. If you’ve overloaded on turkey try lean ground beef or lamb. Almost any meat choice lends itself well to the spice blend I’ve used. Roasted tomatoes add a smokey and juicy element, but the kicker is the the aioli. I’ve combined three accent ingredients of Indian cooking- jalapeno, cilantro, and lime juice- for a zesty aioli with a spicy punch. To use up some of the extra Thanksgiving ingredients I took already cooked mashed potatoes and added curry powder, chicken stock, and some freshly chopped chives for a hearty but healthy side dish. Last kick before the winter holidays folks! Let’s keep it healthy and push through the New Year! Saute the diced onion over medium heat with a dash of butter or olive oil. When the onions are caramelized, add the mashed potatoes and the remaining ingredients; cook until warmed through and season to taste with salt and pepper. Preheat your grill to medium- high heat. In a large mixing bowl, combine the meat with all of the spices. Mix well with your hands to combine evenly. Form into 4 equal-sized patties and set on a cookie sheet covered with foil. Cut the tomato into 4 thick slices, roughly 3/4 inch thick. Lightly drizzle with olive oil and season with salt and pepper. Set them on a separate part of the cookie sheet to be grilled. To make the aioli, combine all of the ingredients- mayonnaise through cilantro- in a small blender. Pulse until everything is minced and well blended. Season with a bit of black pepper if desired. You can also mince everything and whisk by hand. Set aside or make in advance and refrigerate. Cook the burgers on the grill. 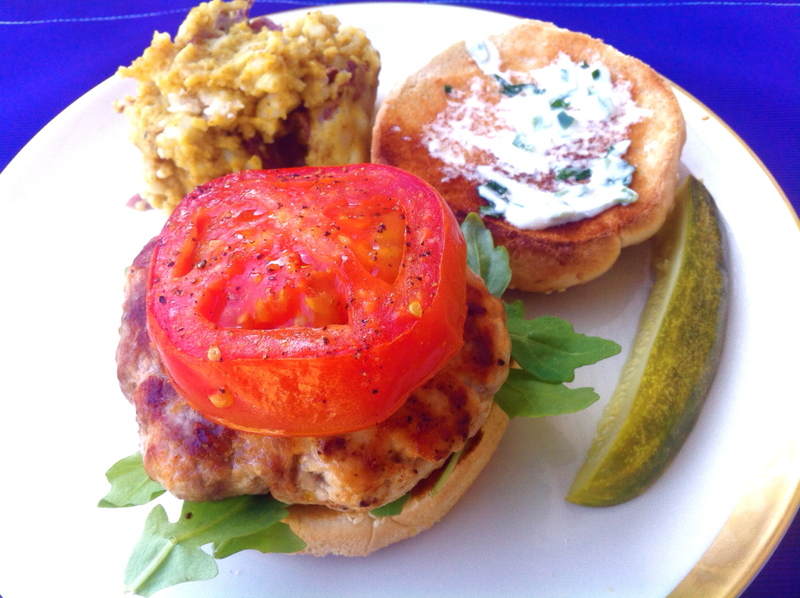 For turkey burgers- roughly 5 minutes per side with the grill closed- beef burgers 3-4 minutes per side with the grill closed depending on if you want them medium or medium well. For the second side of the burgers, add the tomatoes to the grill and cook until there are char marks. Remove the burgers and tomatoes. For each burger, layer arugula, avocado, the burger, and a slice of tomato onto each burger. Put roughly 1 tbs of aioli onto the top of each burger and see immediately. Hi Jamie, I just made these last night and the burgers were great! I love Indian spices and these were very flavorful. I made them exactly as you posted, with all of the condiments, too. We loved them and I will definitely make them again, maybe with lamb next time. I did not make the potatoes, but they sound delicious.